Pic: Bill E. Lytton, Red Telephone Box, from the series London Tourism, 2012. Created by layering thousands of tourist photos of typical London sites. “The most science fictional of […] photographers, in my view, is the British artist Dan Holdsworth. Holdsworth openly deploys the traditional iconography of the sublime. The World in Itself is a series of images of the glacial landscapes of Iceland, territories of ice and rock that are aeons older than the first human settlements on Iceland and which come closest to alien landscapes on earth. Holdsworth has talked about these landscapes in the same sort of multi-temporal terms I’ve been outlining here: these images, he suggests, explore “the nature of the archaic in contemporary society and how that manifests itself” . But more typically, Holdsworth investigates the frontiers where the natural and the technological force a reconfiguring of the sublime. In one of the images for A Machine for Living, Holdsworth invokes the classic iconography of the sublime cliff, but replaces the lone Caspar David Friedrich figure at the summit with an electricity pylon, the power lines containing the chasm beneath. Elsewhere, in a series called At the Edge of Space, Holdsworth explored the strange territories of the European Space Station in French Guyana. He has also documented closed scientific environments that are baffled against the intrusion of sound and abolish echo. His most emblematic series, though, are the images he takes at night of human developments on the edges of cities. A Machine for Living includes night-time images of the empty networks of car-parks and roadways, saturated in neon. Megalith, an iconic Holdsworth image, is a long night-time exposure of a motorway advertising gantry – yet the title suggests some gnomic object of an advanced civilisation from a tale by Arthur C. Clarke. It stands over the terrain like a Wellsian tripod. Holdsworth never works inside cities, but at the suburban edges where develop- ments run into older, natural landscapes and create odd hybrid territories which feel deeply uncanny. He never photographs human beings in these images, and it is as if, at night, and through the magic of long exposures that reveal more than the unaided human eye, these new terrains reveal their truly alien nature. Text: Roger Luckhurst, “Contemporary Photography and the Technological Sublime, or, Can There Be a Science Fiction Photography?” Journal of the Fantastic in the Arts. Pocatello: 2008. Vol. 19, Iss. 2; pg. 181. “One of Jules Verne’s later Voyages Extraordinaires titled Les Freres Kip (The Kip Brothers, 1902) features in its conclusion a somewhat curious scientific concept-yet one which was quite popular during the latter half of the nineteenth century and the early years of the twentieth: the notion that the image of the last thing seen at the moment of death remains imprinted upon the retina of the eye. “A certain Captain Harry Gibson of the English freighter James Cook has been stabbed to death. On the strength of circumstantial evidence, two brothers named Karl and Pieter Kip are promptly arrested and imprisoned for the crime. Photos of the dead body are taken; in particular, snapshots of the victim’s head (with eyes open). An acquaintance of the victim asks the photographer for an enlargement of the head photo as a memento of his dead friend. The photographer agrees and makes several copies of the portrait, giving one to the victim’s family as well. Upon seeing the enlarged photo of his slain father, the young Nat Gibson is seized with grief and bends over to kiss it-and suddenly discerns two small points of light in the eyes of the photo. He examines these with a strong magnifyingglass and discovers therein the faces of the real murderers:two villainous sailors from the James Cook whom the police had initially suspected but against whom no hard evidence could be found. The real culprits are now arrested and condemned; the Kip brothers are vindicated; and the novel concludes with Justice served and the status quo happily reestablished. In an attempt to be scientific,the police pried open Annie Chapman’s dead eyes and photographed them,in the hope that the retinas had retained an image of the last thing shesaw.But no images were found. (Stewart-Gordon121). Text: Arthur B. Evans, “Optograms and Fiction: Photo in a Dead Man’s Eye, Science Fiction Studies, Vol. 20, No. 3 (Nov., 1993), pp. 341-361. 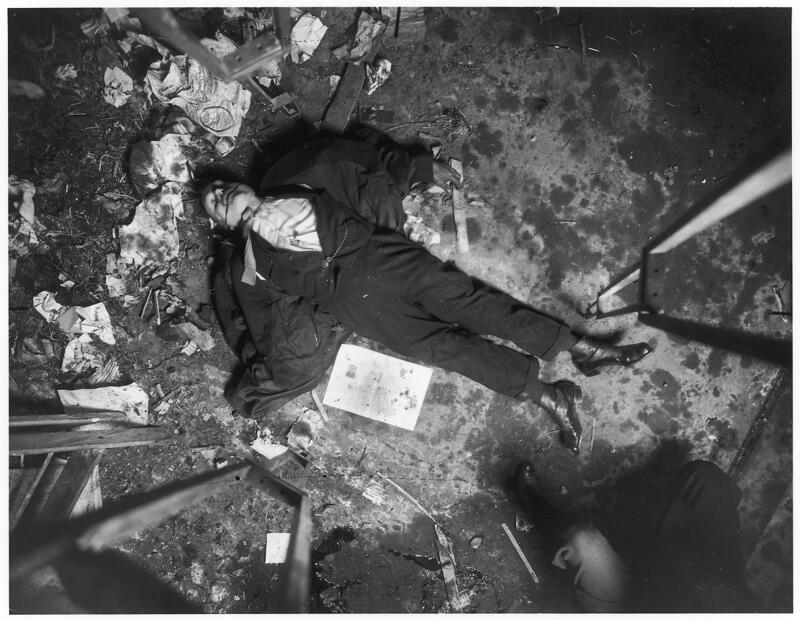 Image: New York City crime scene, 1914-1918, New York City Municipal Archive. “One also wonders what Sontag, or indeed Baudelaire, would have made of Sohei Nishino, a young Japanese photographer whose work goes on show for the first time in Britain at the Michael Hoppen gallery next week. Like Winogrand, Nishino is an obsessive, one who relentlessly pounds the streets with a camera. Yet unlike Winogrand, and every other photographer mentioned above, Nishino does not go in search of the city’s dark seamy corners or neglected populations. What he does is photograph the city in detail, and then construct a composite map from the thousands of detailed images he has amassed on his wanderings. Thus far, he has recreated 10 cities, including Tokyo, Paris, Istanbul and New York. The end results, which he calls “diorama maps”, are both breathtaking in their ambition and disorienting in their oddness. “Last year, Nishino spent a month walking the streets of London – which, come to think of it, does not seem that long a time for the task in hand. He took over 10,000 photographs, which, on his return to Tokyo, he edited down to 4,000. Then the real work began. Having hand-printed the photographs in his own darkroom, Nishino then set about cutting them up and piecing them together – slowly and meticulously – into a giant composite photographic map of the city of London. It measures 7.5ft x 4ft, and will be shown at Michael Hoppen alongside his other diorama maps. “In the meticulous assembling of these photomaps, Nishino creates epic artworks that, despite depicting many familiar icons of modernity and post-modernity – the Empire State building, the Gherkin, the Pompidou Centre – look oddly old-fashioned. He creates what look like medieval or renaissance maps of modern cities. In them, everything is familiar yet oddly disjointed, nothing seems quite in scale and, here and there, whole areas are missing or seem crushed or out-of-proportion. Some of his photographs are taken from above, some from far below. Buildings loom and tilt, as does the terrain, and sometimes a segment of put-together sky appears. 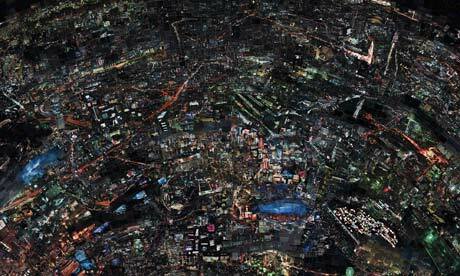 Unreal cities: Sohei Nishino’s magical photographic maps of London, Tokyo and utopia, The Guardian, February 24, 2011.